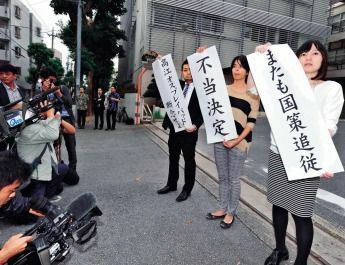 On December 6, defense lawyers for the Takae residents hold banners outside Naha District Court in Higawa, Naha City, accusing the court of making an unjust decision on denying a temporary injunction to suspend helipad construction. In the case 31 Takae residents brought against the Government of Japan concerning helipad construction in the U.S. military’s Northern Training Area (NTA) spanning Higashi and Kunigami Villages, on December 6, the motion for a temporary injunction to suspend construction was denied by the Naha District Court under the presiding judge Kenichi Mori. His reason for the denial was that the residents did not provide enough evidence to convince the court of the illegality of noise and low-frequency sound damage from the helipads after completion. This is the first judicial ruling made regarding helipad construction itself. Judge Mori pointed out that the Japanese government has taken noise measurements in Takae and identified they are within the estimated noise range from the environmental impact assessment (EIA). Therefore the court acknowledged that the noise is reasonable as specified by the EIA. Since the EIA’s estimated noise levels are lower than environmental quality standards, the court declared it is not possible to say that there is danger of illegal aircraft noise from the helipads. In regards to Osprey, the noise from takeoff and landing of these aircraft in the N4 Zone falls below the estimated value of the EIA. As such, the court affirmed that even the noise from the takeoff and landing of Osprey is not unreasonable in EIA terms. Associate Professor Takeshi Tokashiki of the University of the Ryukyus had measurements that showed noise levels exceed environmental quality standards. However, the court found his measurements to be of questionable reliability. Although the court found there is potential for low-frequency sounds to exceed the EIA’s estimation, it declared that there is not sufficient measurement data to presume that low-frequency sounds are constantly occurring at such intensity. Additionally, the court affirmed that it is inherently difficult to accurately ascertain the degree of harm caused to people’s lives and health by low-frequency waves, and as such it is hard to say whether it is possible for the noise infringe on personal rights and be deemed illegal. Upon reception of the decision, the Okinawa Defense Bureau (ODB) announced that in order to reduce the base burden reduction on Okinawa it will move forward with the plan to return about 4,000 hectares of the NTA back to Okinawa by the end of the year, and steadily advance construction of the relocation facility. The ODB expects the helipads to be completed by the middle of this month. The ceremony to celebrate the return of the majority of NTA land to Okinawa and the completion of required helipad construction for the return is planned for December 22.